My ambition to eat healthy and be fit is often met with road blocks. How to do it? Do I have time for it? Can I sustain myself in a new diet that my body is not used to? Then, I get demotivated because living a healthier lifestyle seems so hard to do when I have so many other things that needs my immediate attention. Then I told myself, “It’s ok Sara. One step at a time!”. I believe the first step to live better is to incorporate more fresh fruits and vegetables. The easiest way is through smoothies. I only need to put everything into the blender, press a button and it’s done! The only thing that had been stopping me from having smoothie is time and inconvenience of preparing it, especially in the morning. Imagine my delight to discover the trick of packaging pre-cut fruits and vegetables in freezer bags! 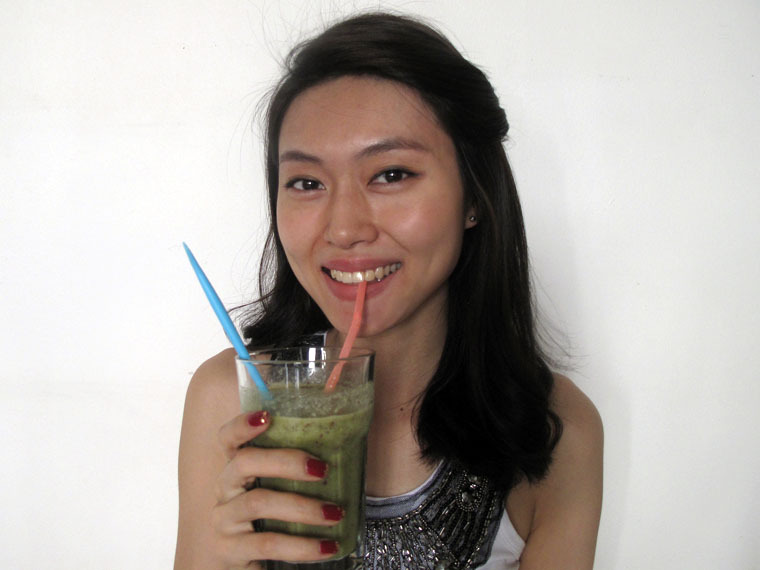 This is one delicious recipe from the classic juicing book Green For Life by Victoria Boutenko. 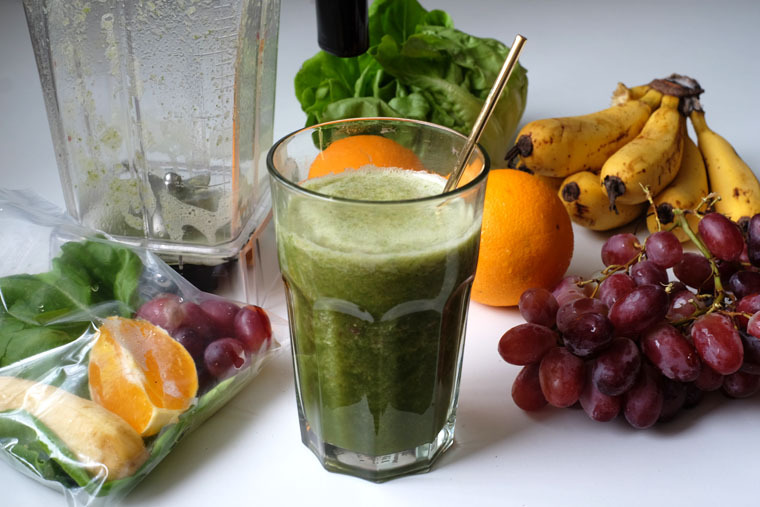 Though it looks very green and unappetising to those who dislike vegetables, it contains sweet ingredients like grapes, oranges and banana. I’m sure it will be popular among kids and people who are sceptical of smoothies. If you want to convert someone into eating better, this is a to-go recipe. Step 3 Keep in the freezer. Step 4 In the morning, simply pour the frozen smoothie bag into a powerful blender. Step 5 Add 3/4 cup of water. Step 7 Ta-da! 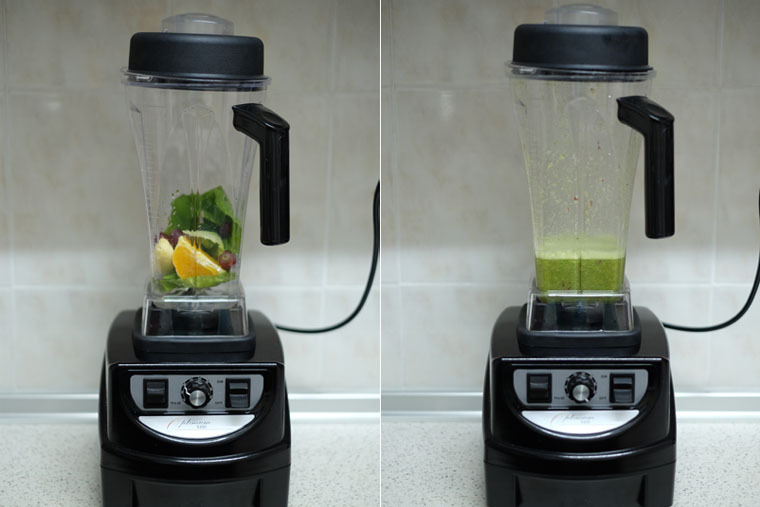 That’s how you can have a healthy, filling and quick smoothie. 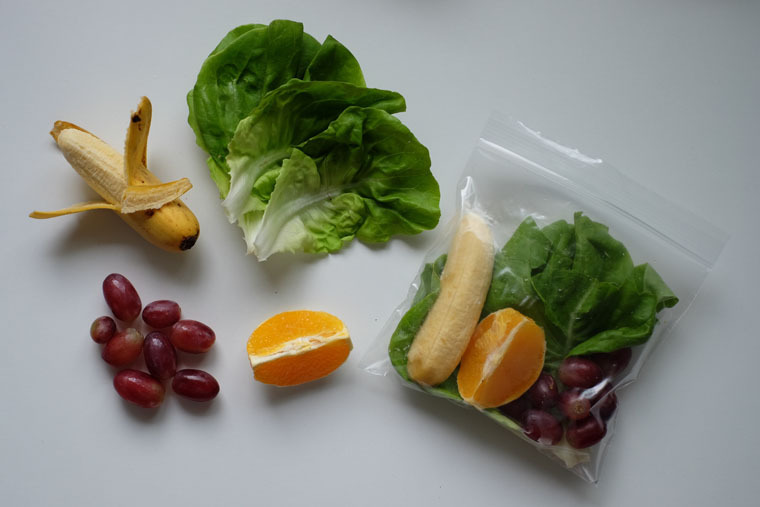 Place 4 lettuce + 1 banana + 1/4 of an orange + 8 grapes into ziplock bag. Seal and freeze. To use: pour 1 packet of frozen fruits + 3/4 cup of water into a powerful blender. Blend and drink. Frozen vegetables and fruits are incredibly hard. However, with a powerful blender, you can instantly juice it in about 10 seconds. Unfortunately, this machine normally cost more than a thousand bucks. If you don’t have one, you may not be able to immediately blend the smoothie packet as it may spoil it. When I had an old and inexpensive regular blender, I toss the content into the blender along with water the first thing in the morning. By the time I’m ready to get out of the house, I could blend it easily and take it along with me. Sometimes I’ll put transfer it into the refrigerator the night before. It also helps to not spoil the blender by chopping the bananas, oranges, and lettuce into smaller pieces. Freezer bags are made to prevent the fruits from being damaged by dehydration and oxidation from the air reaching the food. Hence to maintain the quality of your smoothie, it’s best to use resealable bags than regular plastic bags. This recipe makes eight servings. Each cup is 350 ml. Make smoothie in bags during the weekend so you can enjoy them all week long. If you want to make it first thing in the morning, do defrost it the night before. Though it is best to drink it fresh, smoothies can be kept for up to three days in cold temperature. It’s a rather filling drink that could make a light breakfast. Now, with these ‘instant smoothie packs’, you have a quick and healthy breakfast ready. Make it in the morning and bring it to work. Drink in the car, or pop it into the fridge in the pantry. When you’re hungry and feel like munching some snacks, reach out to your glass of healthy drink! What ingredients do you normally put in your smoothie?